The other day I posted about a koinobori bento that Fumie made for Anthony, featuring koinobori (carp streamers) made from wieners. Today is the Children's Day national holiday in Japan, for which koinobori are flown. 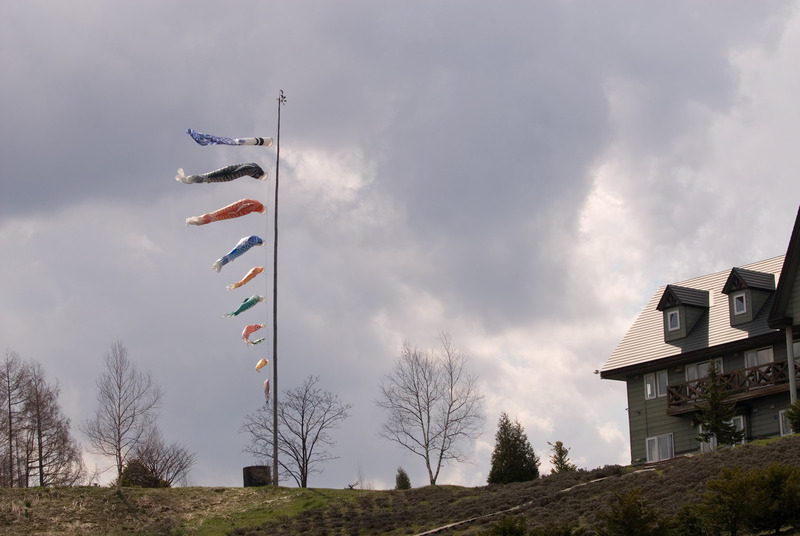 We saw many more koinobori flown while driving around Hokkaido than we do in Kyoto. It was nice. 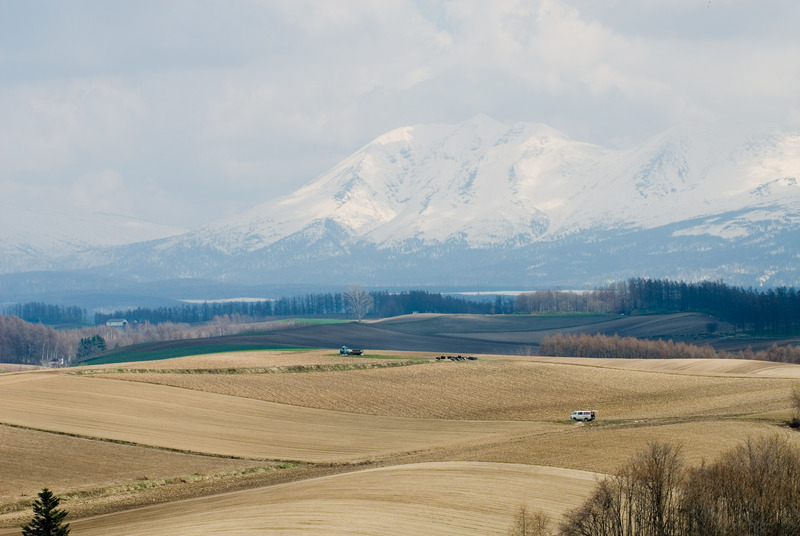 The Biei area is really beautiful, even though the end of April is probably the worst time of year to visit. (See the references to “bland” and “bleak” in my previous post.) In taking the picture above, we'd stopped along the side of the road, as we did numerous times, to enjoy the scenery. Here's a view from the same spot, looking the other way. Apparently, these particular fields are planted with potatoes, yielding a beautiful sea of purple flowers as they grow. For completeness, here's a view of the hotel and its koinobori from the next nearest building, a small restaurant we liked, that I'll write about another day. 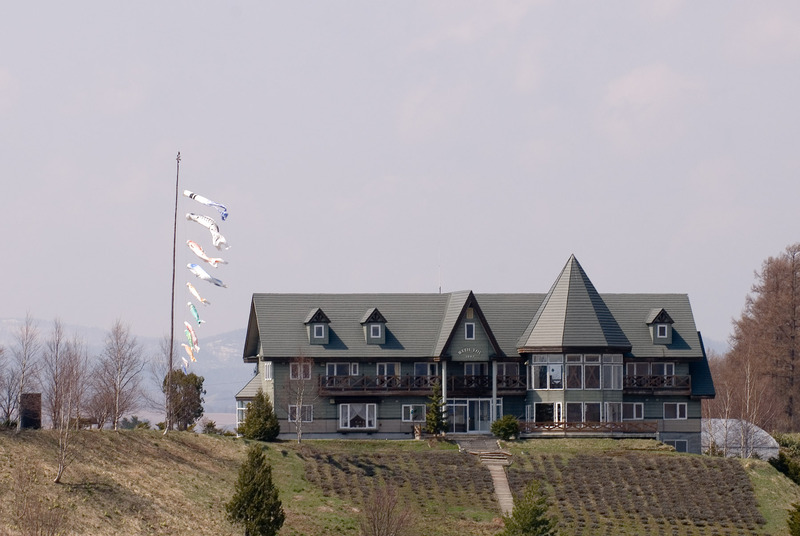 The hill in front of the hotel is planted with lavender, which in early May is gray and dead. I have no doubt that it's excellently pretty in the summer. Fumie and I are absolutely beat from our trip, having returned late yesterday evening. We've been completely groggy all day, as if from a really bad case of jet lag. Maybe it's “boat lag.” Ugh. I hope we feel better tomorrow. Hi, I am looking for a ncie place to stay in Biei, is this hotel nice? Do you have some internal photos to show me? I cant understand japanese and the website is in Japanese, can you share with me some details on how you book this hotel and how much it would cost?